As Slack tries to graduate beyond a Silicon Valley darling to the go-to communications platform within a company, it’s had to find ways to increasingly pitch itself as an intelligent Swiss Army knife for companies — and not just a simple chat app — and it is trying to continue that today once again with a new feature called Actions. Companies can now bake in a user experience of their own directly into the Slack application that isn’t yet another chatbot that’s tied into their services. Developers can essentially create a customized prompt for any kind of action, like submitting a support ticket, within the Slack core chat experience through a drop-down window called an Action. While Slackbots may have been an early incarnation of this, Slack’s platform has grown to include more than 200,000 developers, and there’s still constant need for robust tools internally. This offers partners and developers a little more flexibility when it comes to figuring out what experience makes the most sense for people that sit in Slack all day, but have to keep porting information to and from their own tools. 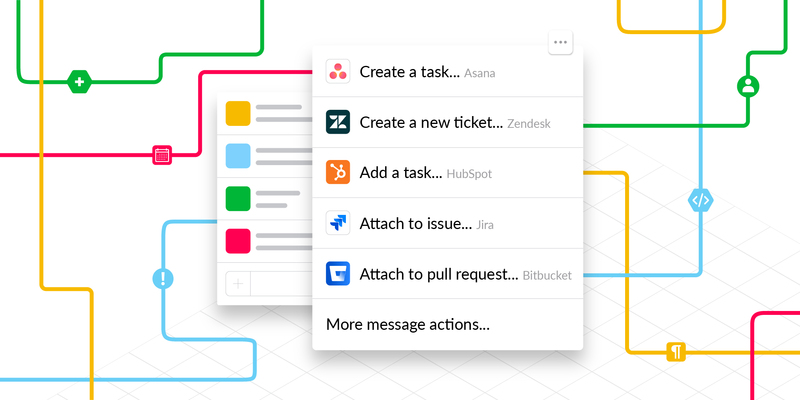 Each company that wants to build in an integration — like Asana for task management or Zendesk for ticket management — works to create a new flow within the core Slack experience, which includes a new dropdown inside a message and a prompt to bake something into the chat flow. Once that happens, all that information is then ported over to the integration and created in the same way an employee would create it within that environment. If someone creates a Zendesk ticket through an action in Slack, Zendesk automatically generates the ticket on their side. Slack has sprawled out over time, and especially as companies using it get larger and larger, the company has to figure out a way to show that it can remain a dead-simple app without turning into a bloated window filled with thousands of instant messages. Actions is one potential approach to that, where users can know from the get-go where to coordinate certain activities like equipment procurement or managing some customer information — and not have to go anywhere else. The other advantage here is that it makes the destination for completing a task not necessarily a “what,” but also a “who.” Slack is leaning on its machine learning tool to make it easier and easier to find the right people with the right answers, whether those questions are already answered somewhere or they know who can get you the information right away. Actions is another extension here, as well, as users can get accustomed to going to certain coworkers with the intent of completing tasks — such as their IT head in their office that they walk by every morning on the way to grabbing coffee. 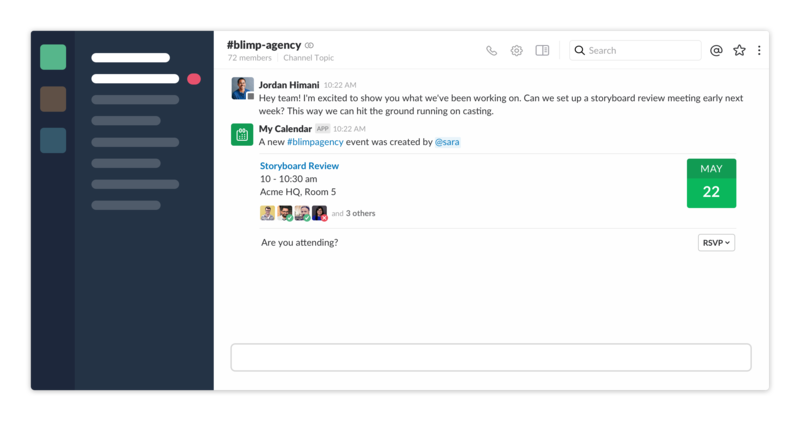 The company says it’s also working on what it’s calling the Block Kit, which integrates those tasks and other elements directly into the Slack chat flow in a way that looks a little more user friendly from a kind of visual sense. The idea here is, again, to create an intuitive flow for people that goes beyond just a simple chat app, but also offers some additional way of interactivity that turns Slack into a more sensible feed rather than just a window with people talking to each other. Actions are available from Jira, Bitbucket, Asana, Zendesk, HubSpot, and several others. Actions is a tool that Slack is unveiling at its own developer conference, Spec, this morning. That in of itself is yet another example of Slack looking to graduate beyond just a simpler information feed that works well with smaller companies. Developers are often the ones that figure out the best niche use cases for any platform, as it means Slack can focus on trying to figure out how all these integrations fit into its design ethos. The company has to figure out how to convince larger companies that they need a tool like this and it won’t get out of hand, and also ensure that smaller companies don’t graduate into something a little more flexible that can serve those niche cases as they get larger. To be sure, Slack is growing. The company said it hit 8 million daily active users with 3 million paid users earlier this month. That’s helped it quickly jump to a $5.1 billion valuation (as of its most recent funding round), and the company has been carefully rolling out tools that might make communication within larger companies a little easier — including the long-awaited launch of threads a little more than a year ago. But Slack also faces increasing competition as time goes on, not only from the traditional companies looking to build more robust but simpler tools, but also from companies that have spent a lot of time working on collaboration tools and are now exploring communication. Atlassian’s opened up its communications platform Stride to developers in February this year. Microsoft, too continues to update its Teams product. Slack was able to expose pent-up demand for this kind of an approach, but it also has to defend that approach — and making it a little more flexible without feature-creeping is going to be its biggest challenge going forward. Posted in Software Development and tagged actions, Apps, Enterprise, Mobile, slack, Startups.